AIIMS Rishikesh Recruitment 2019 - Apply Online for 115 Faculty Posts (Group A) in AIIMS Rishikesh, Rishikesh, Uttarakhand on Direct Recruitment/contractual /deputation Basis. Online Applications are invited by AIIMS Rishikesh from 13 Apr 2019 to 01 Jun 2019 11:59 PM for 115 vacancies. Pay the Examination Fee through online. Fourteen years teaching and/or research experience in recognized institution in subject specialty after obtaining of M.D./M.S. or qualification recognized equivalent thereto. Twelve years teaching and/or research experience in recognized institution in subject specialty after obtaining of M.Ch./D.M. (2 years or 5 years course recognized after MBBS) in respective discipline/subject or a qualification recognized equivalent thereto. Eleven years teaching and/or research experience in recognized institution in subject specialty for candidates possessing 3 years recognized degree of D.M/M.Ch in respective discipline/subject or a qualification recognized equivalent thereto. Fourteen years teaching and/or research experience indiscipline I subject concerned after obtaining Ph.D. Ten years teaching and/or research experience in a recognized institution in subject speciality after obtaining of M.D. /M.S. or qualification recognized equivalent thereto. Eight years teaching and/or research experience in a recognized institution in subject speciality after obtaining of D.M./M.Ch. (2 years or 5 years recognized course after MBBS) in respective discipline/subject or a qualification recognized equivalent thereto. Seven years teaching and/or research experience in recognized institution in subject specialty for candidate possessing 3 years recognized degree D.M./M.Ch. in respective discipline/subject or a qualification recognized equivalent thereto. For Non-Medical candidates: Ten years teaching and/or research experience indiscipline I subject of concerned after obtaining Ph.D.
For Medical Candidates: Six years teaching and/or research experience in experience in a recognized institution in subject specialty after obtaining of M.D./M.S. or a qualification recognized equivalent thereto. Four years teaching and/or research experience in a recognized institution in subject specialty after obtaining of D.M./M.Ch. (2 years or 5 years recognized course after MBBS) in respective discipline/subject or a qualification recognized equivalent thereto. For Medical Candidates: Three years teaching and/or research experience in experience in a recognized institution in subject speciality after obtaining of M.D./M.S. Or a qualification recognized equivalent thereto. Or One year teaching and/or research experience in a recognized institution in subject speciality after obtaining of D.M./M.Ch. (2 years or 5 years recognized course after MBBS) or qualification recognized equivalent thereto. However, no experience is necessary for candidates possessing 3 years recognized degree of D.M./M.Ch. or qualification recognized equivalent thereto. For Non-Medical candidates: Three years teaching and/or research experience indiscipline I subject of concerned after obtaining Ph.D.
Pay Band-4: ₹37 400-67000 with Academic Grade Pay of Rs.10500 (Plus NPA for medically qualified candidates only) with minimum pay of ₹51600 and AGP of ₹10500. Up to 40% of posts of Professors will get Higher Administrative (HAG) scale subject to clearance of prescribed process. In 7th pay commission salary will be in level 14A (₹159100-220200). Pay Band-4: 37400-67000 with Academic Grade Pay of ₹ 9000 (Plus NPA for medically qualified candidates only) with minimum Pay being ₹42800 and AGP of ₹9000. In 7th pay commission salary will be in level 13A (₹131400-204700). Eligible candidates may apply online at AIIMS Rishikesh's website (direct link is given below) from 13 Apr 2019 to 01 Jun 2019. Before applying to Online Applicants have valid email & Scanned copies of photo, signature. Candidates log on to https://www.aiimsrishikesh.edu.in/. Go to "Job / Recruitment"
Read the information carefully & Click on "Apply Online". Complete the Registration & Click on “Submit”. After Registration, Log in with Registered Number & Password. Fill all details in the application & upload Photo, Signature. Application fee should be paid through Online & then Submit the Form. AIIMS Bhopal Recruitment 2019 - Job notification for 142 Non-Faculty Group A, B, and C Posts in AIIMS Bhopal, Madhya Pradesh on Deputation Basis. Applications are invited by All India Institute of Medical Sciences Bhopal on or before 22 Apr 2019 till 05:00 PM for 142 vacancies. AIIMS Jodhpur Recruitment 2019 - Apply Online for 110 Stenographer, Medical Record Officer & Other Posts in AIIMS Jodhpur, Rajasthan on Direct Recruitment. Online Applications are invited by AIIMS Jodhpur from 25 Mar 2019 to 23 Apr 2019 till 05:00 PM for 110 vacancies. AIIMS Gorakhpur Recruitment 2019 - Apply Online for 43 Faculty Posts (Group A) in AIIMS Gorakhpur, Gorakhpur, Uttar Pradesh on Direct Recruitment. Online Applications are invited by All India Institute of Medical Sciences, Gorakhpur from 23 Mar 2019 to 22 Apr 2019 for 43 vacancies. AIIMS Jodhpur Recruitment 2019 - Apply Online for 139 Faculty Posts (Group A) in AIIMS Jodhpur, Rajasthan on Direct / Deputation/ Contract Basis. Online Applications are invited by AIIMS Jodhpur from 23 Mar 2019 to 22 Apr 2019 for 139 vacancies. 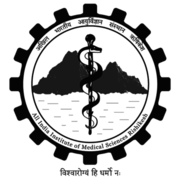 AIIMS Rishikesh Recruitment 2019 - Apply Online for 20 Scientist Cadre Posts (Group A) in AIIMS Rishikesh, Uttarakhand on Direct / Deputation. Online Applications are invited by AIIMS Rishikesh from 15 Feb 2019 10:00 AM to 15 Nov 2019 11:59 PM for 20 vacancies.